Our consumerist culture has eliminated a lot of creativity over the past two decades. Cars and phones, two things that we all need and have changed the way we live as a species, all used to be unique. No two phones and no two automobiles shared the same silhouette. Nowadays you can't tell competing products apart until you can get close enough to see the branding. It's a shame, but most high school have even phased out their shop classes because you can probably buy a decent wooden bench for $15 at your local Big Lots rather than spend hours making one from scratch. As a result, the shop classes that are left have done away with the standard boring curriculum that have been taught in schools since the beginning of the Industrial Age and are adopting projects that would be engaging with students today. New tools like laser cutters and etchers can even be found in some high schools, things that were previously a dream and limited only to large manufacturing firms and their warehouses. Not all can afford such luxuries though, so that leaves the teachers with the job of being a little more creative with their curriculum and let me tell you, some of them have delivered in spades. 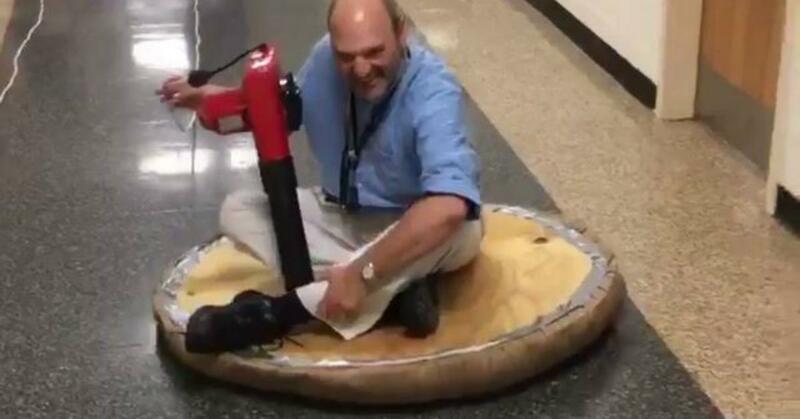 So apparently high school shop class has replaced making lame wooden clocks with DIY hoverboards. I don't know when this phenomenon began, but if you go on Twitter, tons of high school students are tweeting videos of these amazing creations. Although they all look different (they're DIY, after all) they all seem to have one piece of equipment in common: a vacuum cleaner motor. Where the heck were DIY hoverboards when I was in high school? Why wasn't I racing these in the gym with my friends? What was I doing wasting my time cutting open frogs? Why was I memorizing the periodic table? Why was I learning physics "theory" and its applications to engineering instead of actually doing it? I mean I'm happy for these kids, but at the same time, I'm intensely jealous. Some of these creations are really complex. Others are super simple, but equally cool and fun. Apparently, making small hovercrafts is pretty easy. And if you've got a bit more time and patience, building a larger one you can actually ride doesn't seem all that hard, either. That looks like a drunken Saturday afternoon project if I ever saw one.